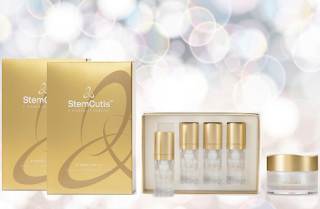 StemCutis aims to restore your skin’s ability to fight the signs of aging with a unique stem cell formula. Stem cells are our body's natural regenerators, yet the effectiveness of our stem cells declines after we reach age 25. That's where science meets nature. StemCutis takes advantage of its exclusive license for stem proteins and factors from an FDA-licensed stem cell manufacturing facility for a skincare formula that aims to restore the glow your skin had when you were young.Apply Synergy Essence and Synergy Cream twice a day, and use the Synergy Patches 2 to 3 times per week. Smoother, brighter and healthier skin. Use our complete system to maximize your results. Experience a 31% reduction in the appearance of fine lines and wrinkles in only 30 days! The Synergy Power Bundle includes a one-month supply: 1 box of Synergy Essence (4 bottles) 1 jar of Synergy Cream 2 boxes of Synergy Patches (8 total applications, 4 applications per box) You can purchase these new products on StemCutis website here. Which right now they are running a special BOGO on the Power Bundle.